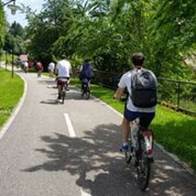 The event had been planned and the route had been decided about six months before the actual event when three members of the Universal Peace Federation representing the three countries Austria, Slovenia and Italy met together in Celje (SLO). 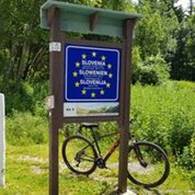 The motto of this Peace Road was decided as well: “Biking for Peace where our Great Grandfathers were fighting 100 years ago”. Six weeks before the actual event concrete preparations got on the way. 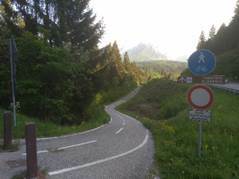 First the route, leading through the three countries, the so called Three Countries Corner (Drei Länder Eck) was selected. Flyers, a banner and white T-Shirts were designed and printed. Then the mayors of the three cities were contacted and visited. Two mayors immediately responded and promised to receive the bikers. 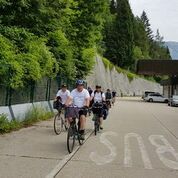 On June 9th, 2018 25 bikers and supporters from three countries gathered in front of the town hall of Arnoldstein including one prominent biker from Klagenfurt, Dr. Marjan Sturm, chairman of all affiliated Slovenian organizations in Carinthia. The mayor of the town, Mr. Erich Kessler, came in time and greeted the group. He outlined his deep desire for friendship and communication especially in this border region and explained about various sisterhood projects with the two neighbouring countries. Then in a solemn moment before the start of the biking Mr. Kessler received the Ambassador for Peace Award. When the content of the document, explaining the core values of the Universal Peace Federation, was read out aloud Mr. Kessler totally agreed with it and mentioned how precious this was for him, more meaningful than any other gift since he was celebrating his 40th marriage anniversary on the very next day. He also received a gift basket with Austrian specialities. 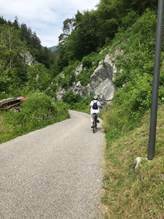 The first, rather challenging stage of the route led from Arnoldstein to Tarvisio, comprising a total of 14 km with woods and hills leading on the former rail track built under the Austrian–Hungarian Monarchy over 100 years ago. 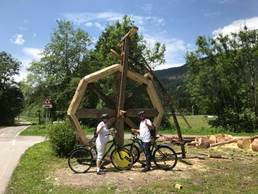 One and a half hour later the bikers arrived at the Piazza Unita in Tarvisio, where refreshments, drinks and snacks were prepared for everybody. 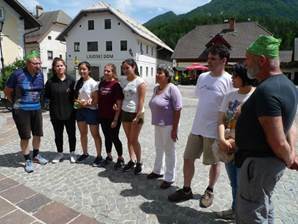 At 12 o’clock sharp the mayor of the city, Renzo Zanetto, came to meet the whole group, accompanied by the two Italian participants, Vittorio Juliano and Roberto Tonna. In his welcome remarks he explained about the importance of friendship and reconciliation between the neighbouring countries. He was the second mayor on this day to receive the Ambassador for Peace Award together with a gift basket from Austria. He listened to the explanation of the award´s content in English and in Italian and gave his farewell to everybody. 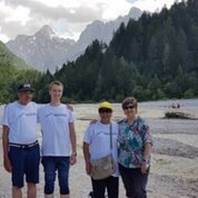 The second part of the tour led 18 km from Tarvisio to the famous tourist town Kranjska Gora at the foot of the Julian Alps in Slovenia. Again a challenging route since there are many ascending passages in this section. The scenery though is breathtaking. Again the bikers went in different speeds. 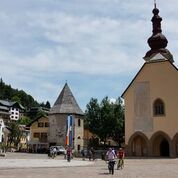 Some would take around one and a half hour time, others two hours and more to arrive at the final destination, the market place in Kranjska Gora. 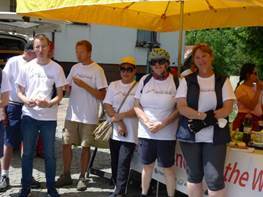 Mrs. Klavdija Gomboc from the Kranjska Gora tourist office officially welcomed the group since the mayor, Mr. Janez Horvath was having another engagement on that day. She explained about different peace activities the community had been undertaking so far. 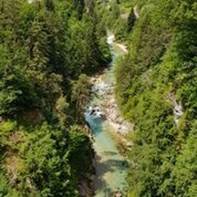 Dr. Marjan Sturm also explained about the joined project “Building the Peace Region Alps Adriatic”, inviting UPF to cooperate in future peace activities. 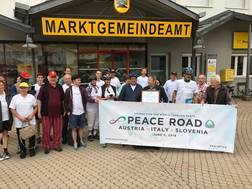 At this point each biker received a participant certificate from Erna Kosmrlj, UPF Slovenia, who also gave the final remarks, concluding the Peace Road. 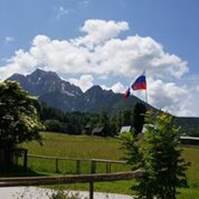 Musicians started to play, Slovenian, Austrian and Italian songs were sung together creating a joyful, harmonious spirit on this beautiful day. Finally all thanks must be expressed to all those who made this project possible through their efforts on that day and beforehand: to the participants from Carinthia, Styria, Burgenland and Vienna from Austria, to all the participating Slovenian friends and families and to our Italian supporters.